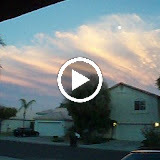 This cloud formation appeared Thursday evening (August 23rd) here in Chandler. The video was taken from my garage. Moisture from hurricane/tropical storm Dean was moving up from the south and all the news stations were on alert, letting everyone know their storm teams were prepared to cover each and every raindrop in real time. A nice example of the beautiful clouds we often see here in Arizona. Fireworks show at the “Chandler’s 4th of July Celebration and Fireworks Spectacular” – Tumbleweed Park, Chandler, Arizona.